For sometime now, I was locking for a smart (== none intrusive, yet powerful) way to prevent users from accidental changing data or property specifications, especially when you have authority data some kind of check and balance should hinder a change to a specification to avoid altered types or worse have those changes flood the job queue and invalidate depending data sets. With #2227 (PropertySpecificationReqExaminer, PropertyPageMessageHtmlBuilder), I was able to add a feature to 2.5 that is small in terms of LOC but does what is required to hinder accidental data modifications. The workflow as very simple, "... any user is qualified to add the Is edit protected property to a subject, yet only a user with a dedicated permission can edit or revoke the protection to an entity after it has been added ..."
A user without an appropriate right (which is maintained in smwgEditProtectionRight) will be given a notice and is unable to edit, delete, or move that page. In case smwgEditProtectionRight is disabled (== false), the Is edit protected property page will notify a user about the circumstances. Only the TitleQuickPermissions hook is used to control and influence on the protection behaviour because "... checked first in the Title::checkQuickPermissions ... are the most basic of permissions needed to perform ..."
@kghbln FYI, Once merged it would be marvelous if you could add $GLOBALS['smwgEditProtectionRight'] = 'smw-pageedit'; to the configuration. PS: I haven't restricted the functionality to only work on the Property NS which means that any page can be protected using the Is edit protected annotation. I have finally done this. Utmost cool! Especially fixed properties and properties of imported vocabularies are born to be used together with this feature. I have finally done this. Utmost cool! 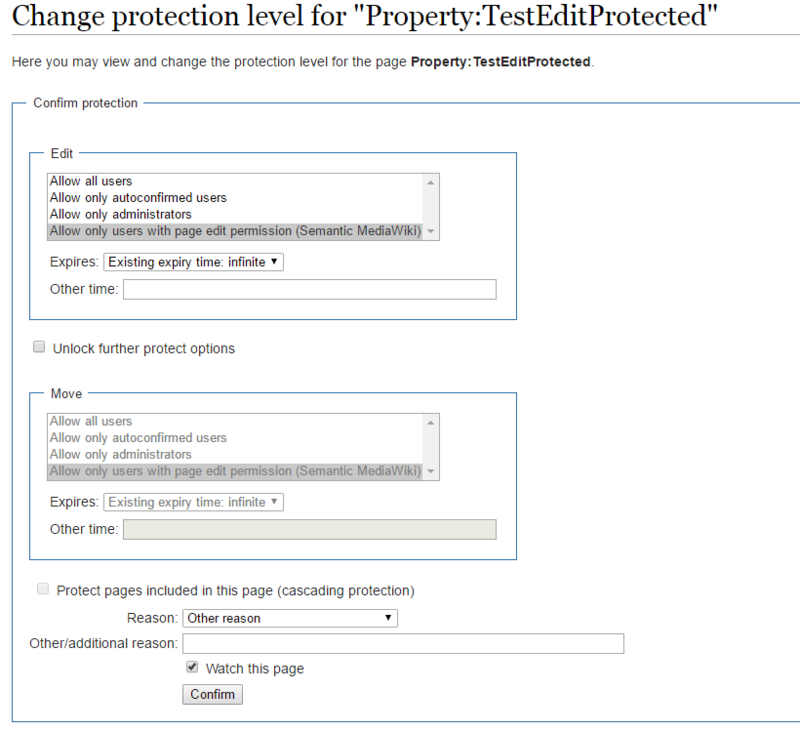 Settings and work done in this PR are a prerequisites but the update on the protect action event to set the Is edit protected property is a bit shaky right now therefore I can't promise that it works from the protect action menu. I can very well imagine that this is not quite as trivial. A lot of users will also used this via a semantic form so both approaches should be somehow compatible if possible. Especially fixed properties and properties of imported vocabularies are born to be used together with this feature. Yes, when I saw changes on the sandbox to same properties, I thought that this sort of thing probably happens fairly frequent and is most likely caused unintentionally, yet creates unfortunate disruptions therefore a solution should be part of SMW-core to hinder such actions. For this feature to work the "smw-pageedit" user right must be added to the configuration parameter $smwgEditProtectionRight in "LocalSettings.php". $smwgEditProtectionRight can contain any right, it is just that "smw-pageedit" is provided for convenience to make the intention more distinct. Is edit protected bounds itself to check against what is maintained in $smwgEditProtectionRight which happens in the EditProtectionValidator. A lot of users will also used this via a semantic form so both approaches should be somehow compatible if possible. I suspect any edit is protected which should include SF as well (I don't have it installed nor have I tested it explicitly). This ended up to be a bit more challenging than anticipated but #2249 contains the necessary changes. I wanted to elaborate more on this on the configuration parameter level. Still a mention on this page is not bad either. Thanks you for being brave and having the required stamina! Great, since this also answers some questions I would have posted here. Just fluffed and tweaked a bit. Is it possible to add an array of rights to $smwgEditProtectionRight? That would require some changes. Any particular use case in mind that would require multiple allowed edit rights? For example, if [[Is edit protected::true]] is set then we force a protection level and in case it is only one the case is simple but when you have multiple which one do you want to enforce? The first one in the array as convention or do you want to add a smwgEditProtectionEnforcedRight setting? I pushed a c88ee7c change that would allow $GLOBALS['smwgEditProtectionRights'] = array( 'smw-pageedit', 'editsemiprotected' ); (PS: mind the name change to the plural form). I haven't really tested it and the question about the enforced right remains open (currently it uses the first right from the array).